The Liz Lange (left, maternity), love the sleeves but it felt a little informal for a 4pm wedding. I wore it to work today instead, and yes that's a bathroom. And the F21 maxi (right, non-maternity, just big). Sometimes length is just dressier. After dinner the cardi came off for strapless dancing. And yes, that is a handmade concrete castle. This is my non-34th Street public service announcement: Jenny Packham bridal gowns are amazing. Unfortunately, they don't carry them at the Macy's Herald Square's bridal salon. But they really should because, well, just look at those pictures. And yes, it did flow like silk/satin water when she walked. Hey, I though the rule was that you weren't supposed to outshine the bride. ;-) You both look radiant and very happy. ooo!! I love that its not a poofy wedding dress! She looks lovely and so do you! I've now decided that maxi dresses look better with a bump. I was reading your old post - seriously, you shouldn't be holding parrots that you don't know while expecting! Fashion Herald...you look beautiful and dare I say it, you are glowing. Way to rock the maxi, lady! La Belette - you are too kind! Kati - me too, that dress is stunning. Maria - Freaking out! I'm so stupid! Lipstick - people keep telling me that, but I think it's just my acne acting up! 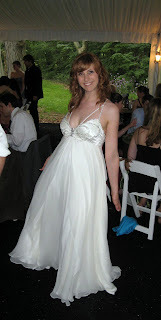 Hi there-the brides dress is so totally stunning! 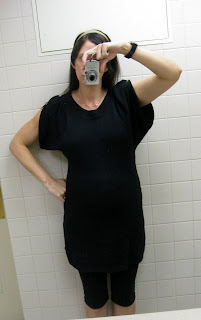 I love the black dresses you chose, the maxi is very stylish! You look great in the maxi with the cardi Miss Fashion, really pretty. 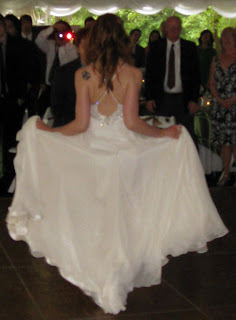 And we'll concur on the Jenny Packham; it is exquisite, simply stunning.